"Chicken house" redirects here. For the children's book publisher, see The Chicken House. "Hen house" redirects here. For the Soviet radar installation designated Hen House by NATO, see Dnestr radar. A chicken coop usually has an indoor area where the chickens can sleep and nest, as well as a fenced-in outdoor area where chickens will feed and spend the majority of the day (which is typically made from chicken wire). The coop should be cleaned after every two weeks, and the straw shifted every day, similar to a litter box. At night, the coop should be locked with all the birds inside of it, so that they are protected from predators. Both the inside and outdoor floors of a chicken coop are often strewn with a loose material such as straw or wood chips to deal with chicken droppings and to provide ventilation. 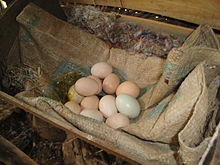 Eggs in a chicken coop. 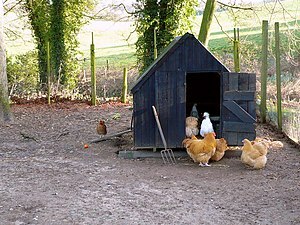 A chicken coop in a smallholding. The purpose of a chicken coop is to protect chickens from bad weather - heat, cold, wind and rain and secure them from predators-especially foxes and cats. One method to protect chickens is to put an isolation material between two layers of wood or bricks. As too much heat can prove to be fatal, windows should be oriented in such a way as to prevent overheating, and proper ventilation measures should be taken to prevent infectious bronchitis and overheating as well. The hens can be released outside by daylight but should be locked in a coop at night. There is a long-standing controversy over the basic need for a chicken coop. One philosophy, known as the "fresh air school" is that chickens are mostly hardy but can be brought low by confinement, poor air quality and darkness, hence the need for a highly ventilated or open-sided coop with conditions more like the outdoors, even in winter. However, others who keep chickens believe they are prone to illness in outdoor weather and need a controlled-environment coop. This has led to two housing designs for chickens: fresh-air houses with wide openings and nothing more than wire mesh between chickens and the weather (even in Northern winters), or closed houses with doors, windows and hatches which can shut off most ventilation. Regardless of design, experts agree that proper ventilation of the chicken coop is crucial for the health and well-being of the birds. Poorly ventilated chicken coops can lead to heat stress or stroke, and to the build-up of toxic fumes within the coop. Backyard coops are small and often enclosed within a fenced area (sometimes bounded by chicken wire), thus creating a more natural living environment, one in which the chickens can roam freely and forage for food. If this kind of "yarding" is both floorless and reasonably mobile, it is called a chicken tractor. The number of small coops in urban areas of wealthy countries has been growing. This growth has led to the marketing of manufactured chicken coops, such as Eglu, which are designed for more cramped spaces and a tidier look. 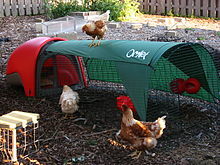 Manufactured chicken coops are primarily marketed towards urban coop owners and are often more expensive than building one's own coop. 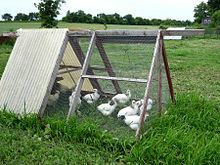 Urban settings may have laws which regulate backyard keeping of fowl. For example, Oakland, California, bans roosters and has a rule stating that hens must be kept at least twenty feet away from dwellings, schools and churches. ^ Woods, Prince T. (October 2008). "Fresh-Air Poultry Houses". Norton Creek Press. Retrieved 18 April 2012. ^ North and Bell, "Commercial Chicken Production Manual", 5th ed. Van Nostrand Reinhold, 1990, p 189. ^ "Deciding On Your Chicken Coop". Chicken Coops and Plans. Retrieved 18 April 2012. ^ "Animal Services". City of Oakland Animal Services. Archived from the original on 17 April 2012. Retrieved 18 April 2012. ^ Skinner, Katy. "Chicken Laws". TheCityChicken.com. Retrieved 18 April 2012. "More people turn to chickens as pets". USA Today. 20 July 2007. "Backyard chicken basics". University of Minnesota extension. 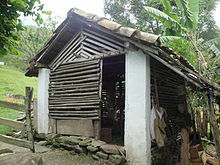 Wikimedia Commons has media related to Chicken coops.